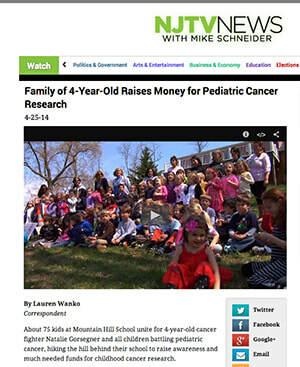 Fundraising is NOT easy, but something that always helps our efforts is exposure. Thank you to everyone who has taken the time to listen and share our story and mission. Whether it's our foundation or another childhood cancer group, please help all of us raise awareness and funds simply by sharing our stories, our social media posts + blogs. Sometimes all it takes is one person to truly make a difference, and you just never know where that person will show up. 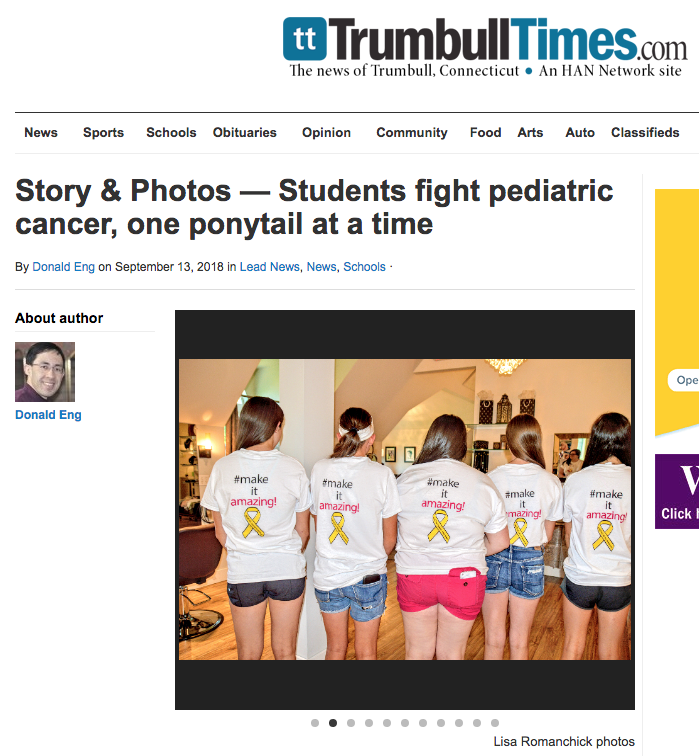 one ponytail at a time"
"September is Childhood Cancer Awareness Month and a group of Trumbull High students and faculty are marking the occasion with the first Infinite Love’s Mane Event, a hair donation and fund-raising event to benefit Infinite Love for Kids Fighting Cancer. Infinite Love funds research grants for pediatric cancer and has partnered with the town to fight pediatric cancer one ponytail at a time, by raising money and awareness. Its executive director is Trumbull High teacher Jim McCaffrey, whose daughter Mia passed away in 2017 due to rhabdomyosarcoma. Read More. heads for the best reason." 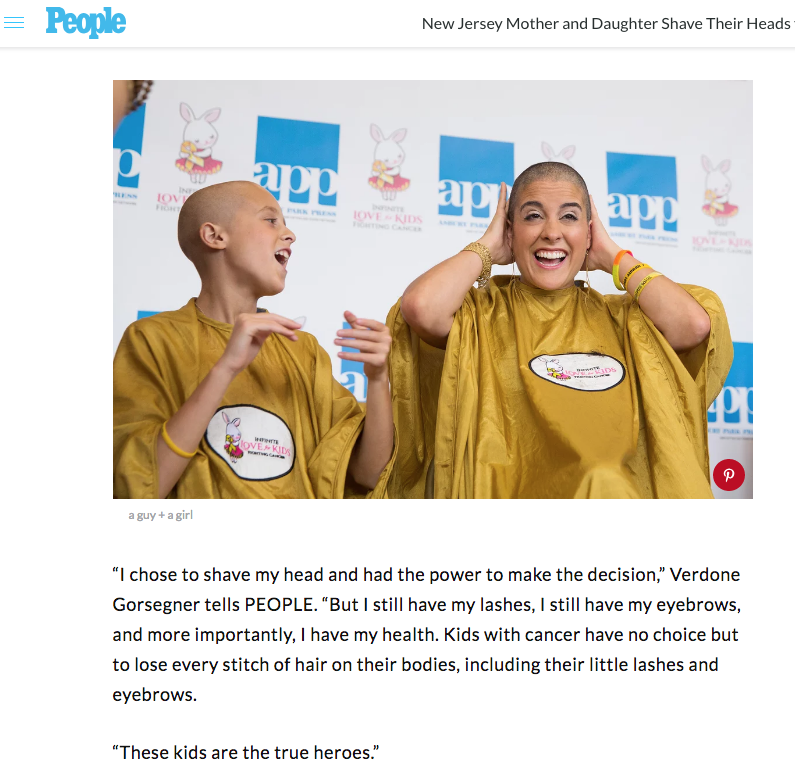 "Andrea Verdone Gorsegner and Hannah Gorsegner had a surprising mother-daughter outing last month that resulted in matching buzzcuts. Read More. "Earlier this month, I had the absolute pleasure of meeting Natalie and Hannah Gorsegner, and singer/songwriter Taylor Tote, who together wrote and recorded the hit single "Fighter." Read More. Trumbull Boy Who Lost Sister to Cancer"
"After Mia McCaffrey passed away last week at the age of 6, the charity Infinite Love for Kids Fighting Cancer set out to show love and support for Mia's 5-year-old brother James. The group is asking people to send James cards to help bring him some joy in this difficult time." Read More. 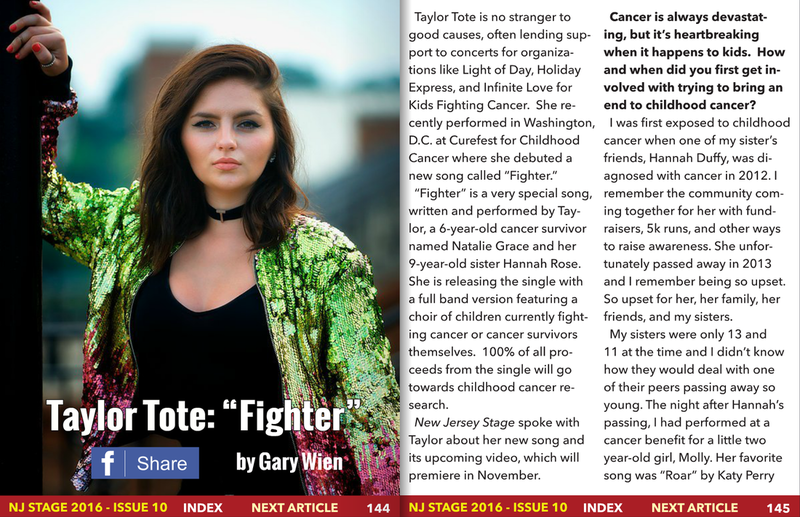 "New Jersey musician Taylor Tote has teamed up with 7-year-old cancer survivor Natalie Grace and Natalie’s big sister Hannah to create a true anthem for kids with cancer." Read More. with Local Singer in Video." Community Magazine (September 2016 issue). "Middletown resident Natalie Grace Gorsegner has the makings of a star – and she is only six-years-old! You see, Natalie Grace is a cancer survivor and her greatest wish is to raise as much money as possible so that doctors and researchers will discover less harmful treatments for the thousands of kids who are currently battling cancer." "Taylor Tote's Fighter Set For Tuesday Release." Asbury Park Sun, October 2016. 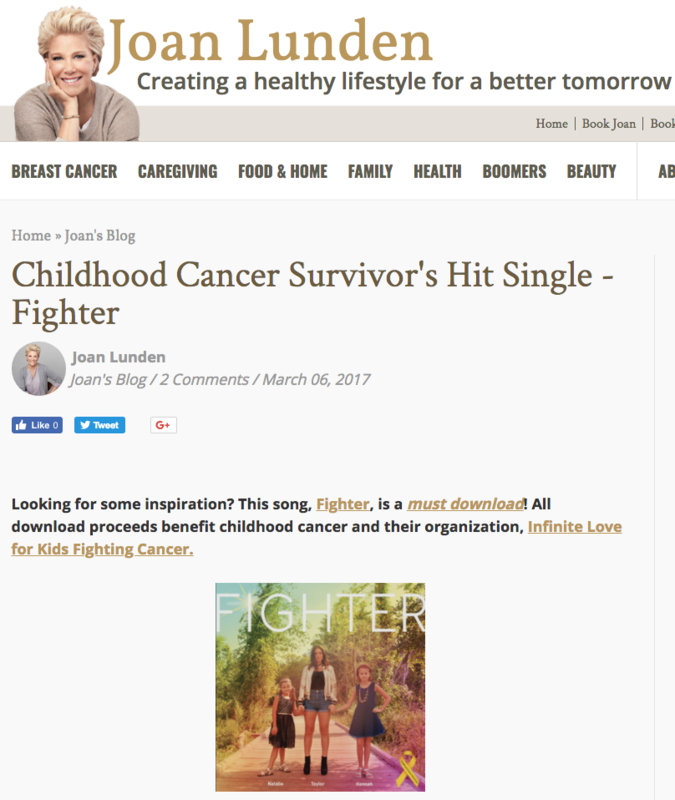 "Due to be released via iTunes Tuesday, Taylor Tote’s “Fighter” is a collaborative anthem to and from the youngest among us who have faced a cancer diagnosis. 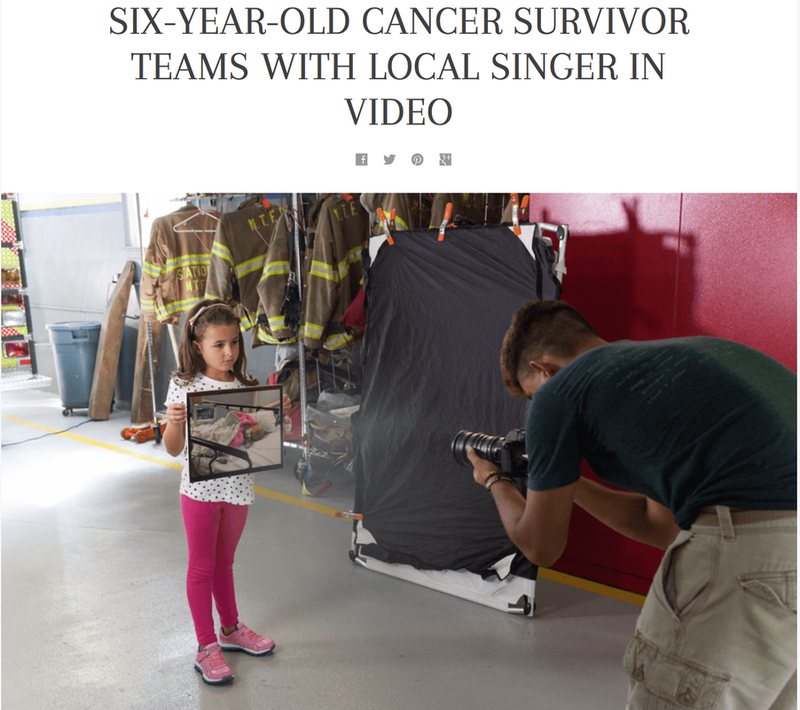 Tote, 21, cowrote the single with 6-year-old acute lymphoblastic leukemia survivor [ALL] Natalie Grace and her 9-year-old sister Hannah Rose Gorsegner last year." Read More. 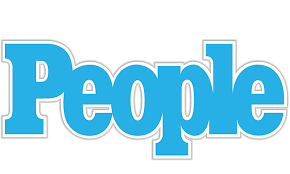 Parents magazine (November 2014 issue). “I've been working at TODAY for 10 years and have had the privilege of telling many stories, but the story of these two little sisters is one of my favorites.” Read More. "Little Natalie Gorsegner of Middletown, N.J., was just 3 years old when she was diagnosed with high-risk acute lymphoblastic leukemia.Her symptoms appeared over the course of a week in August 2012. Her mom, Andrea Verdone Gorsegner, first noticed tiny red dots near Natalie’s eye. The next day, she had a low-grade fever, which persisted for a few days." Read More. “Aug. 16, 2012 is a day that local residents Andrea and Dan Gorsegner will never forget as that’s the day they were told that their then 3-year-old daughter, Natalie Grace, had high-risk acute lymphoblastic leukemia.” Read More. Life & Living with Joanna Gagis's interview with Infinite Love founder Andrea Verdone Gorsegner. 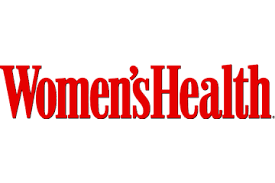 "Andrea Verdone Gorsegner, founder of Infinite Love, discusses her family's personal journey with her daughter's leukemia diagnosis." Watch interview. 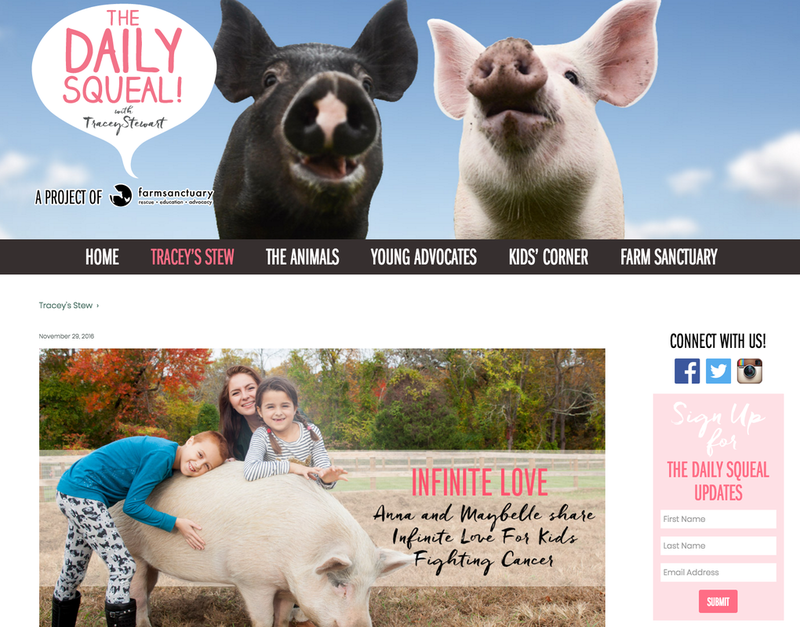 Infinite Love for Kids Fighting Cancer"
"Here at the Squeal we have the luxury of watching the beautiful connection between sisters Anna and Maybelle everyday. These gals have been through so much and no doubt have given each other the strength to get through the rough patches. Recently, we became aware of another truly remarkable pair of human sisters, Natalie and Hannah Gorsegner." Read More. 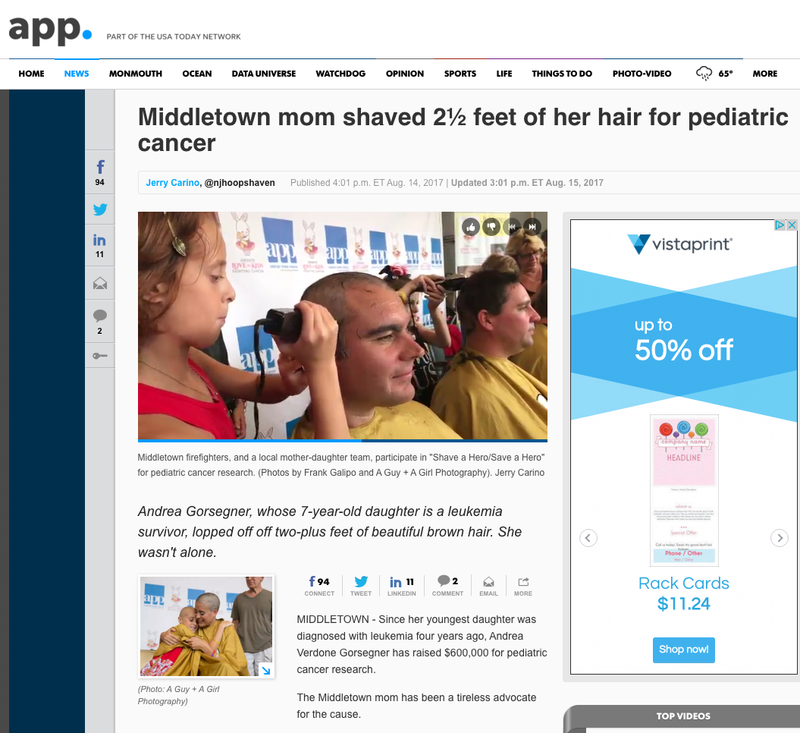 her hair for pediatric cancer"
"Since her youngest daughter was diagnosed with leukemia four years ago, Andrea Verdone Gorsegner has raised $600,000 for pediatric cancer research." 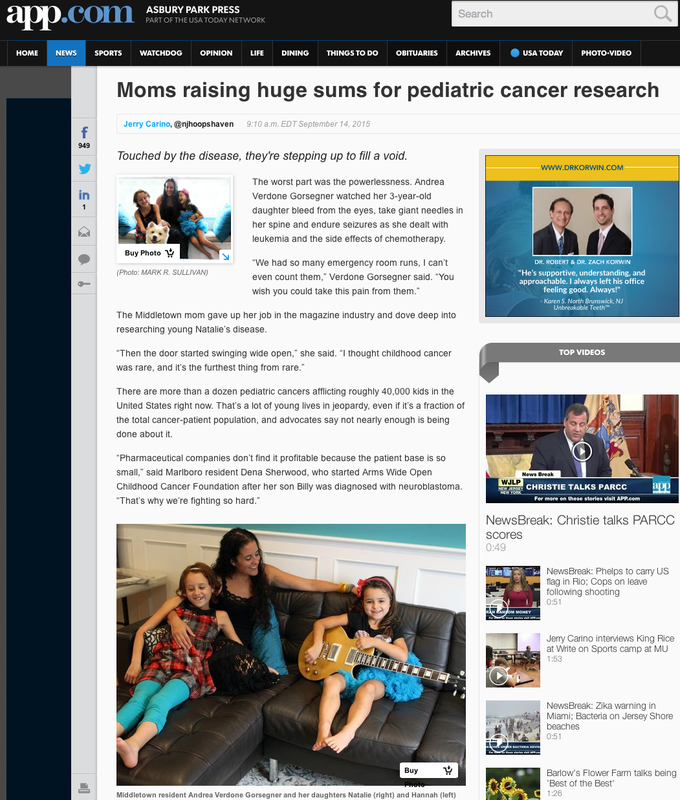 "Everything changed for Andrea on August 16, 2012—her daughter Natalie (far left), then just 3 years old, was diagnosed with high-risk acute lymphoblastic leukemia." Read More. at Asbury Park Music & Film Festival"
"Fighter" is a very special song, written and performed by Taylor, a 6-year-old cancer survivor named Natalie Grace and her 9-year-old sister Hannah Rose. Taylor is releasing the single with a full band version featuring a choir of children currently fighting cancer or cancer survivors themselves. Read More. What It Means To Be A Fighter." 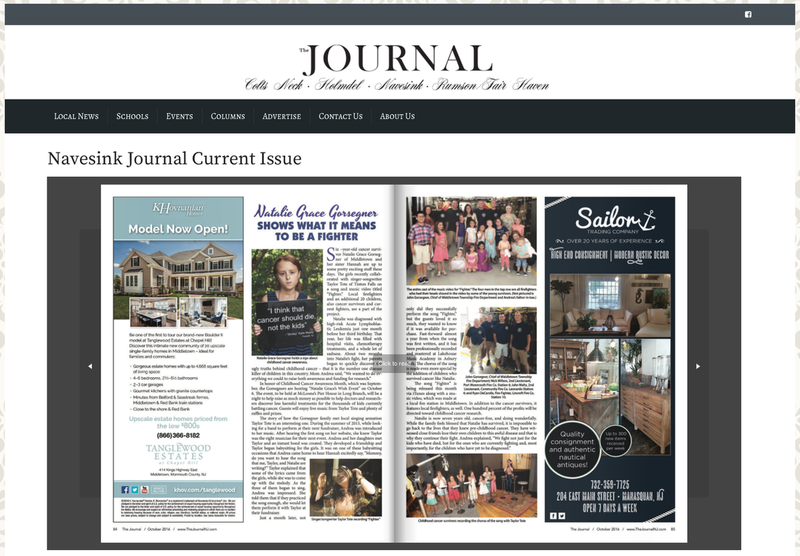 The Navesink Journal (October 2016 issue). "Six-year-old cancer survivor Natalie Grace Gorsegner of Middletown and her sister Hannah are up to some pretty exciting stuff these days. The girls recently collaborated with singer-songwriter Taylor Tote of Tinton Falls on a song and music video titled "Fighter." Local firefighters and an additional 20 children, also cancer survivors and current fighters, are a part of the project. 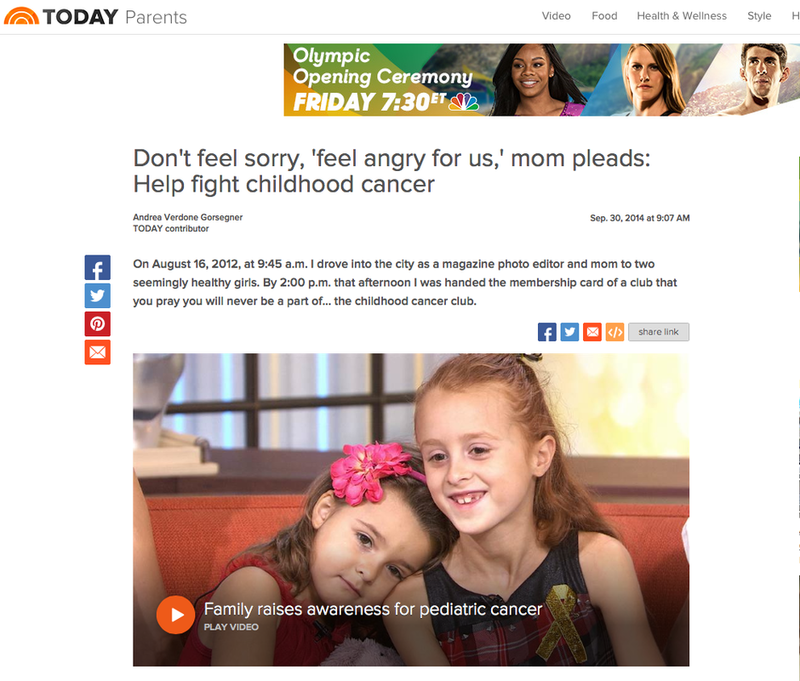 Watch this five minute segment as the Gorsegner’s raise some much needed awareness and where (then) 7-year-old Hannah Rose announces that she’ll be shaving off her long beautiful red locks in honor of the kids fighting cancer. “This is one of the little ways that I can help kids with cancer and inspire them to be brave in their treatment.” Watch Here. 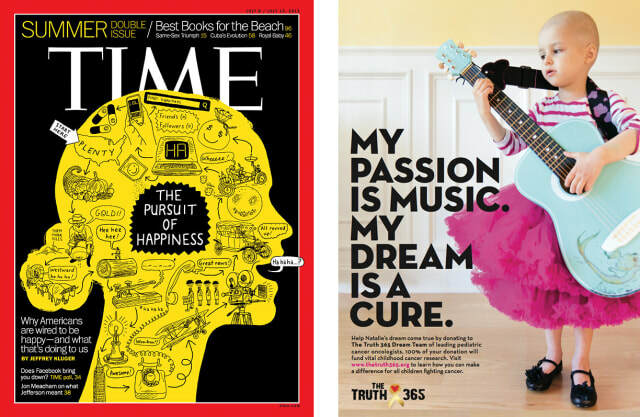 July 15, 2013 issue of Time magazine. “The worst part was the powerlessness. 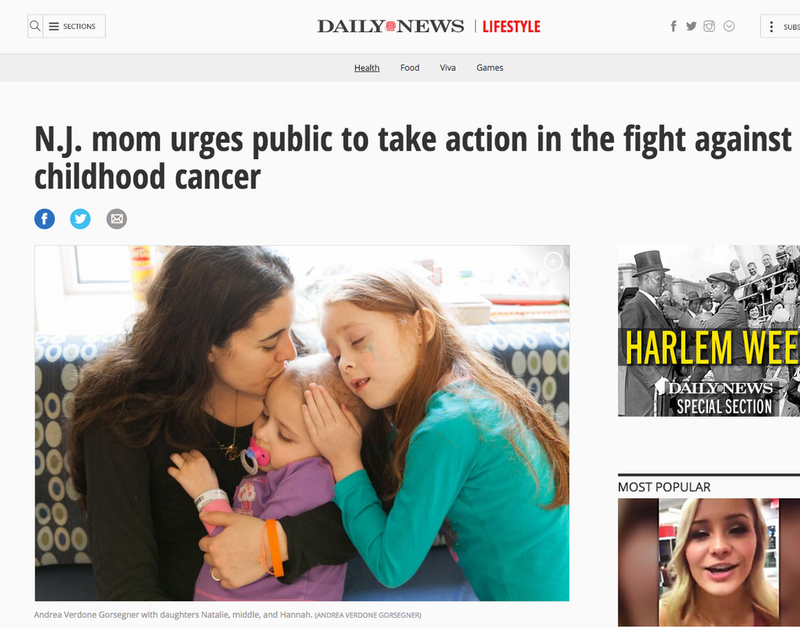 Andrea Verdone Gorsegner watched her 3-year-old daughter bleed from the eyes, take giant needles in her spine and endure seizures as she dealt with leukemia and the side effects of chemotherapy.” Read More.